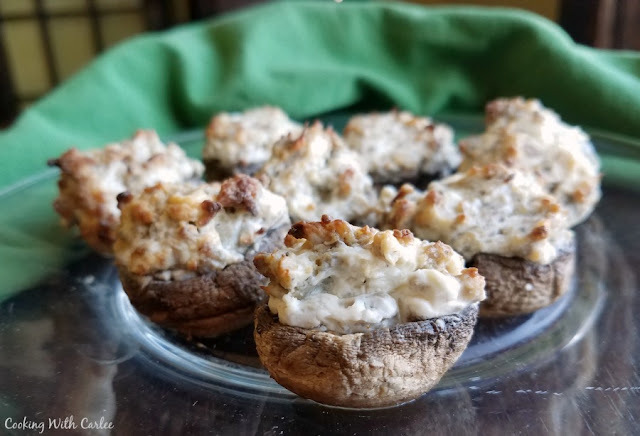 These creamy sausage filled stuffed mushrooms are always a hit. They are the perfect appetizer for a party or great for game day as well! This recipe is a big favorite in our family. My cousin Cori made them again for Christmas and they disappeared even though she made a double batch. So I figured I better make some more and update the pictures in this post. I also made a double batch for our New Year's Eve appetizer buffet. They were a hit again. My husband, Little Dude and I could probably polish off a batch ourselves and happily call it dinner! A few of my family members thought it would be fun to have a virtual Super Bowl party since we weren't all able to get together for the big game. We have been having so much fun passing recipes around lately, this was a great way to show each other what we were making. 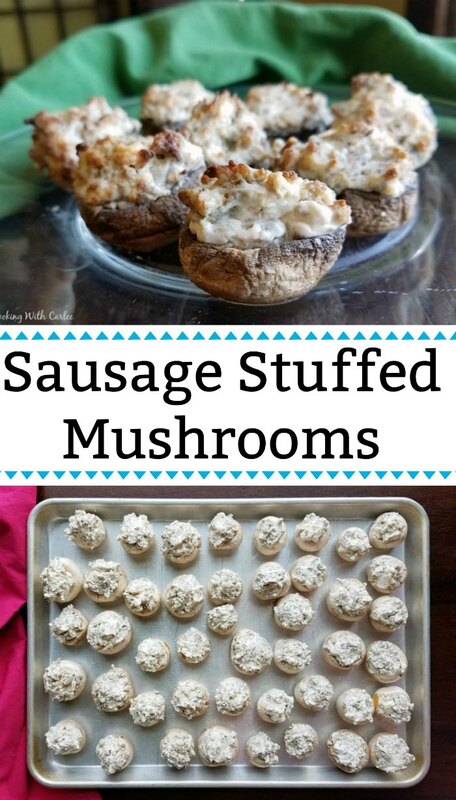 Cori shared her sausage stuffed mushrooms. She knew she would have us all drooling. We had a progressive dinner a while back. Cori hosted the appetizer course, my parents did the entree and we ended with desserts here. We all had new homes and had just decorated for Christmas. It was such a fun way for the extended family to get to see our new houses all decorated for the season. Cori had an amazing spread of appetizers. These mushrooms were on the menu and everyone loved them. I am pretty sure I had more than my fair share and I enjoyed every one of them. 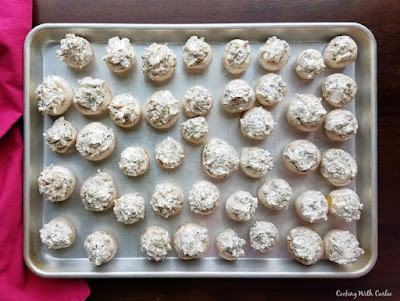 Cori has shared a number of delicious recipes with us. These include a baked tortellini casserole, gone in a second pickles and refrigerator pickles. She also was the inspiration for the yummy pasta salad we served at her bun in the oven baby shower! I could go for a tray of these right now! Maybe just a plateful for dinner? Now I really wish this Super Bowl party was real and not virtual!! We love mushroom snacks too. I think they'll be on our menu as well! Thanks as always, sweet friend! Oh! She Who Must Be Obeyed would love these! You had better maker her some then! I love stuffed mushrooms and actually made some for New Year's Eve this year. I'll have to try your recipe the next time! We love them too! What do you put in yours? My dad's friend used to make something similar, and these were always a hit at parties! Thanks for sharing at Friday Frenzy Link Party! PINNED! They are soooooo good! Thank you! 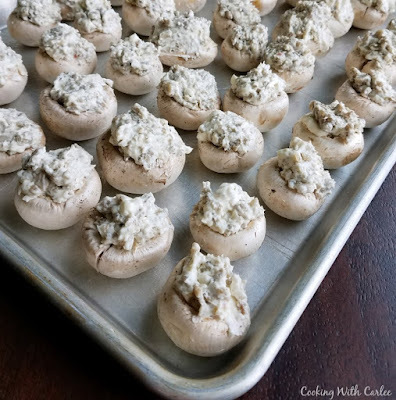 I love a great stuffed mushroom and this recipe looks awesome! Happy to see you here at Full Plate Thursday and thanks so much for sharing with us. Aren't they so good?! Thank you! Your progressive party sounds like soo much fun! And these mushrooms?? Oh my... perfect party food! Wow I never thought to stuff mushrooms this way--so tasty!